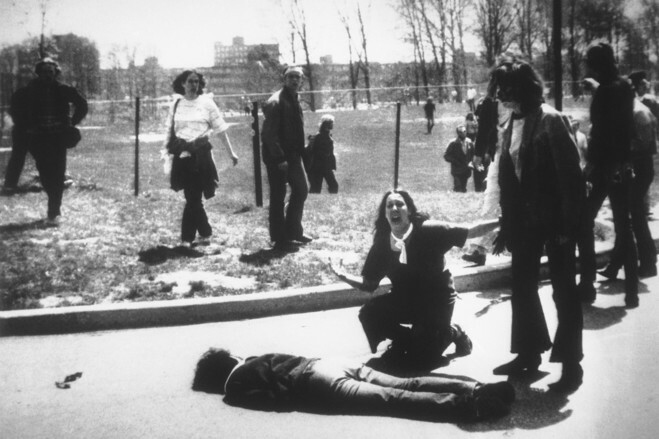 The Kent State shootings—also known as the May 4 massacre or the Kent State massacre—occurred at Kent State University in the U.S. city of Kent, Ohio, and involved the shooting of unarmed college students by the Ohio National Guard on Monday, May 4, 1970. The guardsmen fired 67 rounds over a period of 13 seconds, killing four students and wounding nine others, one of whom suffered permanent paralysis. Some of the students who were shot had been protesting against the Cambodian Campaign, which President Richard Nixon announced in a television address on April 30. Other students who were shot had been walking nearby or observing the protest from a distance. It was quite clear to all of us what was going on. 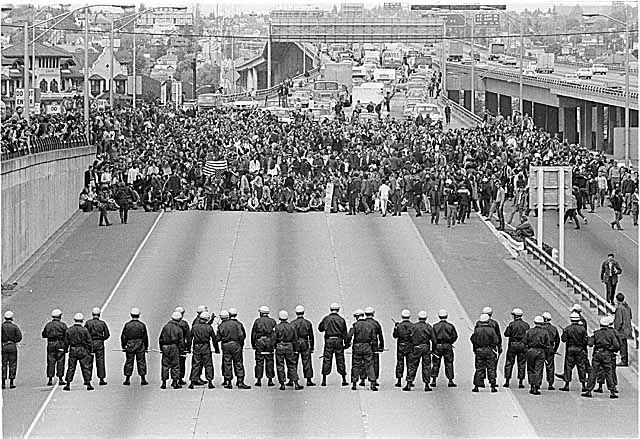 The government regarded the war protesters as no different from the Vietnamese whose country it was trying to overtake. 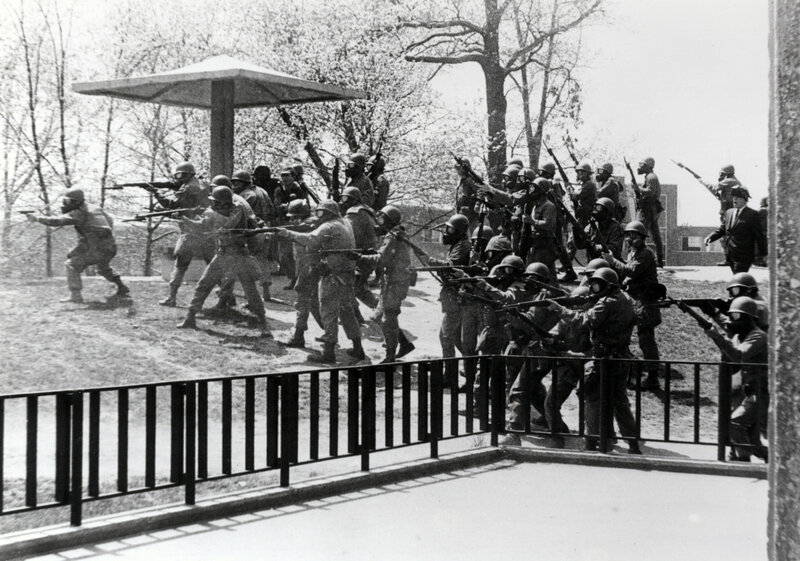 *On this date in 1970, the Jackson State killings occurred. In the spring of that year, campus communities across this country were characterized by protests and demonstrations. No college or University was left untouched by confrontations and continuous calls for change. At Jackson State College in Jackson, Mississippi, there was the added issue of historical racial intimidation and harassment by White motorists traveling Lynch Street, a major thoroughfare that divided the campus and linked west Jackson to downtown. 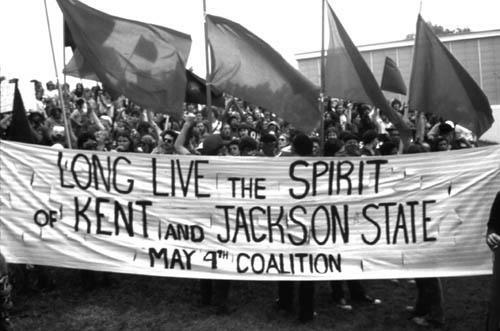 On May 14-15, 1970, Jackson State students were protesting these issues as well as the May 4, 1970 tragedy at Kent State University in Ohio. The riot began around 9:30 p.m., May 14, when rumors were spread that Fayette, Mississippi mayor Charles Evers (brother of slain Civil Rights activist Medgar Evers) and his wife had been shot and killed. Upon hearing this rumor, a small group of students rioted. That night, several White motorists had called the Jackson Police Department to complain that a group of Blacks threw rocks at them as they passed along the stretch of Lynch Street that bisected the campus. The rioting students set several fires and overturned a dump truck that had been left on campus overnight. Jackson firefighters dispatched to the blaze met a hostile crowd that harangued them as they worked to contain the fire. Fearing for their safety, the firemen requested police backup. The police, blocked off the campus. National Guardsmen, still on alert from rioting the previous night, mounted on Armored Personnel Carriers, the guardsmen had been issued weapons, but no ammunition. Seventy-five city policemen and Mississippi State Police officers all armed, responded to the call. Their combined armed staved off the crowd long enough for the firemen to extinguish the blaze and leave. After the firemen left, the police and state troopers marched toward a campus women’s residence, weapons at the ready. At this point, the crowd numbered 75 to 100 people. Several students allegedly shouted “obscene catcalls” while others chanted and tossed bricks at the officers, who had closed to within 100 feet of the group. The officers deployed into a line facing the students. Accounts disagree as to what happened next. Some students said the police advanced in a line, warned them, and then opened fire. Others said the police abruptly opened fire on the crowd and the dormitory. Other witnesses reported that the students were under the control of a campus security officer when the police opened fire. Police claimed they spotted a powder flare and opened fire in self-defense on the dormitory only. The students scattered, some running for the trees in front of the library, but most scrambling for the Alexander Hall west end door. There was screaming and cries of terror and pain mingled with the noise of sustained gunfire as the students struggled en masse to get through glass double doors. A few students were trampled. Others, struck by buckshot pellets or bullets, fell only to be dragged inside or left moaning in the grass. When the order to ceasefire was given Phillip Lafayette Gibbs, 21, a junior pre-law major and father of an 18 month-old son lay dead. Across the street, behind the line of police and highway patrolmen, James Earl Green, 17, was sprawled dead. Green, a senior at Jim Hill High School in Jackson, was walking home from work at a local grocery store when he stopped to watch the action. Twelve other Jackson State students were struck by gunfire. The five-story dormitory was riddled by gunfire. FBI investigators estimated that more than 460 rounds struck the building, shattering every window facing the street on each floor. Investigators counted at least 160 bullet holes in the outer walls of the stairwell alone bullet holes that can still be seen today. The injured students, many of whom lay bleeding on the ground outside the dormitory, were transported to University Hospital within 20 minutes of the shooting. But the ambulances were not called until after the officers picked up their shell casings, a U. S. Senate probe conducted by Senators Walter Mondale and Birch Bayh later revealed. The police and state troopers left the campus shortly after the shooting and were replaced by National Guardsmen. After the incident, Jackson authorities denied that city police took part. But the real purpose of the bomb was to keep the populace cowed, frightened and unquestioning. Happily it didn’t stop us. Neither did the Kent State Massacre. And thanks in no small part to continued protest the U.S. eventually withdrew from Vietnam. Realizing “this couldn’t goon any longer” the Powers That Be created “Think Tanks,” took over Universities to promulgate so-called “Conservatism” and banned the Left from ever appearing again on television. Happily shortly after the Kent State Massacre THIS appeared.